Clovis points are the characteristically-fluted projectile points associated with the New World Clovis culture. They are present in dense concentrations across much of North America; in South America, they are largely restricted to the north of that continent. Clovis points date to the Early Paleoindian period roughly 13,500 to 12,800 calendar years ago. Clovis fluted points are named after the city of Clovis, New Mexico, where examples were first found in 1929 by Ridgely Whiteman. Besides its function as a tool, Clovis technology may well have been the lithic symbol of a highly mobile culture that exploited a wide range of faunal resources during the Late Pleistocene and early Holocene. As Clovis technology expanded, its very use may have affected resource availability, being a possible contributor to the extinction of the megafauna. 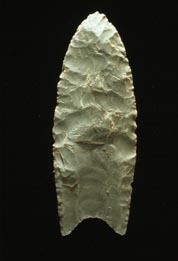 Clovis points were first discovered near the city of Clovis, New Mexico, and have since been found over most of North America and as far south as Venezuela. Significant Clovis finds include the Anzick site in Montana; the Blackwater Draw type site in New Mexico; the Colby site in Wyoming; the Gault site in Texas; the Simon site in Idaho; the East Wenatchee Clovis Site in Washington; and the Fenn cache, which came to light in private hands in 1989 and whose place of discovery is unknown. Clovis points have been found northwest of Dallas, Texas. In May 2008, a major Clovis cache, now called the Mahaffey Cache, was found in Boulder, Colorado, with 83 Clovis stone tools. The tools were found to have traces of horse and cameloid protein. They were dated to 13,000 to 13,500 YBP, a date confirmed by sediment layers in which the tools were found and the types of protein residues found on the artifacts. ^ "A Clovis Spear Point". Archaeological Research Center. South Dakota State Historical Society. 2004-02-13. Archived from the original on 2009-05-18. ^ Elias, Scott A. "Paleoindian and Archaic Peoples". People of the Colorado Plateau. Northern Arizona University. Archived from the original on 2012-12-21. ^ "13,000-Year-Old Stone Tool Cache in Colorado Shows Evidence of Camel, Horse Butchering". University of Colorado at Boulder. February 25, 2009. Archived from the original on 16 October 2011. Retrieved 22 September 2010.